The Vermont Sail Freight Project. I think it’s really wonderful that this group is trying to bring back commercial sail in the US. They’re also working in another area I like which is good food. The sailing barge Ceres is working with a great project bringing farm fresh food down to New York City. I think there is a definite place for sailing ships even in these modern times. With all the attention being focused now on the environment, climate change, the high price of fossil fuels, etc., we should be taking a new look at sail (traditional or new improved models). I’d love to make a voyage on her myself. Or any of the other similar ships around the world. There are a few of them now, the Bessy Ellen and the Tres Hombres (both with Fairtransport) which are truly cargo ships along with the Ceres of Vermont Sail Freight Project. The barque Picton Castle (home port Nova Scotia) is primarily a sail training vessel but also does some cargo work. 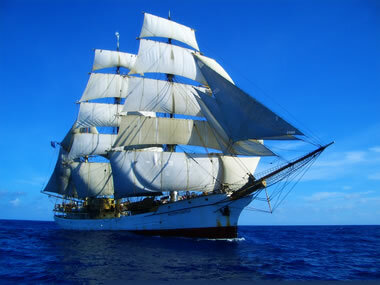 She sails worldwide and is presently making her way across the Pacific. This entry was posted in economy, environment, food, History, lifestyle, maritime, things to do, travel, Uncategorized and tagged barque Picton Castle, brigantine Tres Hombres, cargo sail, Ceres, Dykstra, Dykstra Naval Architects, ecoliner, Erik Andrus, green shipping, green transport, local food, NaBloPoMo, National Blog Posting Month, Netherlands, new designs for sailing ships, reducing emissions at sea, sailing cargo ships, sailing ships, sky sails, sustainable shipping, Tres Hombres, Utne Reader, Vermont Sail Freight, Vind by Capt Jill. Bookmark the permalink. that’s an inspiring bit of news! Good luck with your sailing plans! yeah, one day I sure do hope to have both the time and the money to do a long trip sailing a traditional rig. That Picton Castle is VERY expensive!! The Tres Hombres is much more affordable.